Father's Day is right around the corner - this Sunday, June 16th, to be exact. 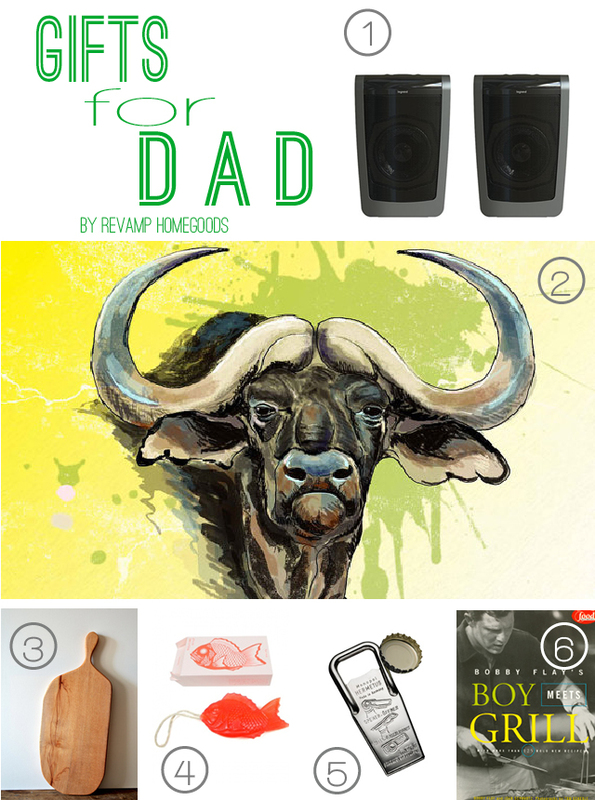 Whether the Dad in your life loves music, grilling or just a bold buffalo - this roundup of gifts is sure to show that special guy how much he means to you. 1) The Wifi Music kit from Legrand tops the roundup because each of the dads in my life (the hubs, the dad and the dad-in-law) would do a sweet fist pump-kick combo to open them up on Father's Day. The Wifi Music kit seamlessly connects to a wireless network and can be controlled via a smart phone or tablet. Plus, combined with the Adorne system, you can utilize multiple pairs of speakers (up to three pairs) throughout the home. They even sound pretty rad to me...late Mother's Day gift? 2) Cape Buffalo Print from artist, Patrick Logue, is bold, beefy and would be a great addition to the man cave. 3) Reclaimed Wood Cutting Board from Etsy shop, triple7recycled, is gorgeous, practical and perfect for a socially conscious Dad or a guy who just likes to chop things. 4) Tomanohada Soap on a Rope from Thomas Sires - this soap on a rope is a fresh twist on an old classic. The traditional Japanese welcome soap brings good fortune and the Tai fish symbolizes prosperity and wealth - I don't know anyone who would be unhappy with that. 5) Hermetus Bottle Opener from Kaufman Mercantile is the beer lovers dream - well, a good beer lover's dream. Yes, we're beer snobs - not so much snobs since we'll drink pretty much anything - we just prefer really good beer. Why the Hermetus? Well, I'll let their witty description win you over, like it did me. The first sip of a freshly opened beer is the closest that anyone can get to understanding a brew master’s true intention. The fragrance of the hops, the tingle of the carbonation and the depth of the flavor consume your senses — it is almost as if the tipple is whispering brewery secrets into your taste buds. This fleeting moment is the wedding of wet to whistle and, for the true beer enthusiast; the honeymoon should last as long as possible. If you’re sitting with a 12-ounce of Coors, you probably won’t need to pop open the top then close it back up before finishing. But the size of regular beer bottles are getting larger and craft beers, lambics and ciders are sometimes sized for more than one sitting. This bottle opener and resealer is a great pocket-sized gadget to have in order to make sure that not a drop of that dear brew goes to waste. Once the resealer is slid into place, the seal is tight enough that none of the liquid will spill even if tipped completely upside down. 6) Bobby Flay's Boy Meets Grill is the perfect resource for that man behind the grill, with more than 125 recipes for mouth watering meat, poultry, and fish dishes, as well as soups and salads that can be prepared partially or completely on the grill.